Professional football players are frequently faced with difficult decisions, like what to do with all their free time after an early retirement, or which of several buxom glamour girls with monokini tan lines should be their next sexual conquest. At least, that’s the life of a pro baller according to HBO’s Ballers, the new comedy from the Entourage brain trust and a worthy successor to its vapid, for-bros-by-bros legacy. To its credit, Ballers is refreshingly overt, unlike HBO’s subtle, quasi-sitcoms such as Togetherness. It won’t take three or four episodes for the audience to decide whether or not Ballers is a good fit. The proposition is simple: There’s a never-ending party featuring vodka torrents, cocaine flurries, larger-than-life personalities, and larger-than-natural breasts. Wanna go? 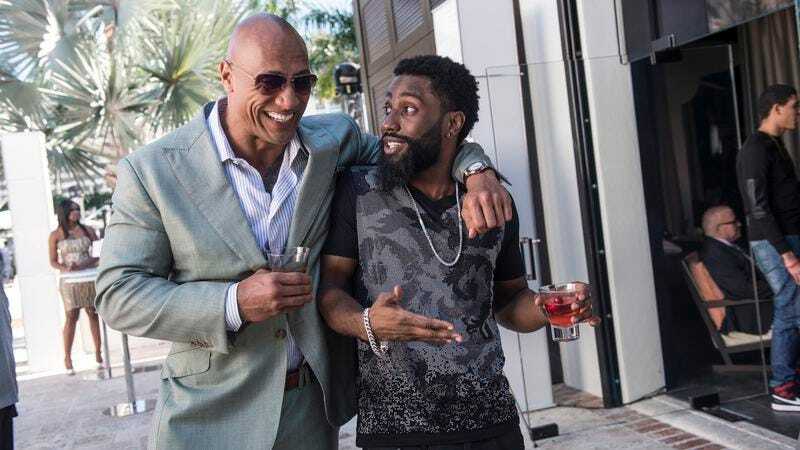 Dwayne Johnson stars as Spencer Strasmore, a retired pro football player trying to reinvent himself as a financial manager in Miami using his stardom and personal connections. Or as his smarmy boss Joe (Rob Corddry) puts it, Spencer is trying to “monetize his friendships.” The sudden death of a player galvanizes Miami’s pro football community, granting Spencer the opportunity to formalize his relationships with former colleagues whose support he needs to be successful in his second act. Spencer’s faux-family includes Vernon (Donovan Carter), a promising player with an insatiable entourage; Ricky (John David Washington), a wide receiver with a habit for boorish behavior befitting his position; and Charles (Omar Benson Miller), a retired linebacker struggling with his decision to trade in his career for the quiet life of a family man. The power dynamics in Ballers are different enough from Entourage to justify why its creator, Entourage producer Steve Levinson, thought the show could exist independently of its predecessor. Spencer is more of a father figure to the younger players than he is a peer, and he’s still reduced to begging them to sign with his firm. Spencer isn’t the superstar trying to manage his coterie of hangers-on. He’s the hanger-on himself, doing his best to calibrate his ego as he transitions from being “the man” to being “the man next to the man.” The moneyed milieu of Ballers doesn’t accurately reflect Spencer’s current lifestyle, and the audience is apparently meant to invest in how Spencer reclaims his comfort. Despite Ballers’ attempts to portray Spencer as a struggling everyman, the show is still a blue-skies, wish-fulfillment show, so Spencer is constantly reminding people that the suit he’s wearing was custom-made for him. The setbacks Spencer faces aren’t genuine roadblocks, at least in the four episodes screened for critics, and the main challenge he faces is how to go from winning all the time to winning slightly less of the time. Ballers also suffers from a deep inauthenticity in its portrayal of life after professional sports. Spencer is shown taking painkillers, which he chews and swallows by the handful like bulk candy, and he’s in denial about the possibility his football career has left him with lasting neurological damage. But there are none of the horror stories so common to former pros. It’s no wonder Spencer has so much trouble convincing these young gladiators to think about the fiscal future awaiting them after their playing days are over. Spencer is stuck in the same position, and as far as anyone can tell, his biggest concern is whether someone’s going to damage his impeccably tailored suit. Even this much analysis of Ballers is probably excessive, given its abject lack of ambition. It only wants to be a hangout show about football pros and their life of excess, and its only requirement of the viewer is a desire to occupy that world. The show is beyond redundant between the just-released Entourage movie and Starz’ Survivor’s Remorse, a much sharper and funnier take on the life of luxury professional athletes enjoy. But the characters are generically charming. Spencer is the show’s straight man, which feels like a waste of Johnson’s proven comedic abilities, but the actor’s inherent likeability makes Spencer watchable despite being the show’s least interesting character. Miller is fun as Charles, an aspiring car salesman who’s gradually wooed back into the limelight. Corddry’s Ari Gold facsimile is serviceable. But the real surprise is John David Washington, a former football player and son of Denzel and Pauletta Washington, who brings a natural charisma to his performance as Ricky. Even when the performers are at their best, Ballers makes a case for getting them better material. Like Entourage, Ballers is infectious precisely because it emphasizes surfaces over depths and requires almost nothing from the audience. The carefree, sun-soaked Miami of Ballers makes a terrific summer destination, and thanks to some shrewd music supervision, it also sounds good. (There’s a case to be made for any show that provides a wider platform for Slave’s “Watching You.”) But Ballers is hollow at its core. “Everyone gets wasted on a big yacht” is an exhaustive plot description for one episode. It is what it is, a perpetual invitation into a gilded world of end-zone glory and half-naked debauchery. Seriously: You wanna go or nah?